Don’t live with Heel Pain or Plantar Fasciitis! When heel pain strikes, it can be debilitating. Many people with heel pain or heel spurs in Pittsburgh, can’t walk—let alone enjoy an active lifestyle—because it can be so painful. But, using state-of-the art technology, Dr. Christina and her staff at Beaver Valley Foot Clinic can resolve your Plantar Fasciitis, or heel pain, and you can regain your life! Why Are You Experiencing Heel Pain or Heel Spurs? Who Is Most Susceptible to Heel Pain and Heel Spurs? Where Is the Heal Pain Located? Plantar Fasciitis (sometimes called a heel spur), is a painful heel condition that inflames the bottom of the foot when a ligament that runs from the heel bone to your toes becomes strained. Achilles tendonitis occurs when tissue connecting your lower leg’s calf muscles to your heel becomes overused, causing heel pain. Runners frequently experience Achilles tendinitis. Heal pain problems, in some cases, can be resolved through traditional conservative therapies like orthotics, exercise, ice, physical therapy, cortisone injections, or anti-inflammatory medications. However, sometimes heel pain can’t be resolved through these remedies. How is heel pain treated in Runners? There are many treatments for heel pain, Pittsburgh. Shoe recommendation/ modifications like proper shoes for your activity. Rest. Take a few days off or decrease training. Taping for biomechanical treatments helps temporarily. Ice the area. Apply frozen veggies for ten – twenty minutes after activity or after work. Stretch (toes to nose) before getting out of bed in the morning and several times through out the day after resting or driving. Wear shoes at home inside the house- do not go barefoot. NSAIDs (non-steroidal anti-inflammatory drugs) give temporary relief. ESWT for treating heel pain. Surgical options are a last resort. If you think you may have heel pain or plantar fascia pain, Pittsburgh, you can CONTACT US for assistance 878-313-3338 to find the nearest Beaver Valley Foot Clinic office in your area. Extracorporeal Shock Wave Therapy, or ESWT, is a noninvasive alternative to painful surgeries. It treats chronic plantar fasciitis as a cause of heel pain. This is an excellent office procedure when all other conservative methods have failed! Achilles tendon rupture cannot be solely treated with OTC medications, physical therapy, and heel lifting devices. If you feel a sudden “pop” or like you were shot in the back of the leg or can’t stand on your tip toes, surgery is sometimes needed. If your Achilles tendon has ruptured, you may need surgery that will attach your tendons back together, and will then have a cast for six to 10 weeks. Commonly occurring in boys of 10 to 12 years old and 8 to 10 years old girls, Calcaneal apophysitis often occurs during or after a growth spurt and at the start of sports seasons. Your child may complain of pain during or after running and jumping activities. Tight Achilles tendons or plantar fascia, along with overuse, high-impact sports, improper footwear and uneven training surfaces all may lead to heel pain in children. The “squeeze test,” involves squeezing the bone of the heel medially and laterall y causing compression over the growth plate which is called the apophysis, causing pain. Treatment may include decreased running and increase cross-training activities until the pain diminishes. If you are experiencing plantar fasciitis or heel spurs, or any type of heel pain, call Beaver Valley Foot Clinic’s 4 convenient locations today at 878-313-FEET (3338) so that Dr. Christina can assess your situation, administer treatment, and get you back on the road to feeling good again! Emergency appts reserved for Weekend, same day and evenings. Why choose us as your Allegheny, Beaver or Butler County Foot Care Office? What do you do when your heel hurts? Can Plantar fasciitis go away on its own? Sometimes if you catch it quick enough in the beginning, heel pain can resolve on its own, but if it has been present two weeks or more, get it checked out. It may become chronic, thus harder to treat. What is ESWT, Shockwave Therapy (Extracorporeal Shockwave Therapy)? ESWT or Extracorporeal Shock Wave Therapy is a noninvasive treatment option for heel pain relief especially chronic with plantar fasciitis as a cause of heel spurs. Originally used as lithotripsy to dissolve kidney stones, Shockwave therapy for heel pain involves pressure waves, or sound waves, being directed extracorporally (from outside the body). Unlike surgery, which is very invasive, this noninvasive procedure directs the pressure waves into the heel of the foot. This stimulates the body’s own healing process. ESWT can also over-stimulate lcaolly inflamed nerves, reducing their sensitivity and tenderness in the heel spur area. Shockwave Therapy is not new, having been developed in the 60s' for kidney stones, and since 2002 has been FDA approved to treat plantar fasciitis. Since then thousands of patients heel pain and many other chronic joint injuries have been treated with non-invasive ESWT. The Dornier Epos Ultra machine delivers many tiny bursts of very high intensity acoustic energy to the damaged fascia or tendons —it is these tendons, and not the "spur" ( which is a common misconception) which cause the painful symptoms in most patients. It is not ultrasound energy -the same type used by ultrasound machines to image babies and abdominal organ, that is the treating energy; the ultrasound in this machine is used for guidance and illuminates the areas of maximum inflammation, indication where treatment should be directed. We typically recommend that our heel pain Cannonsburg patients choose ESWT after exhausting conservative options like stretching, arch supports and local injections or other antiinflammatory medications. The Dornier Epos Ultra for heel spurs is specifically designed for use to treat orthopedic problems. 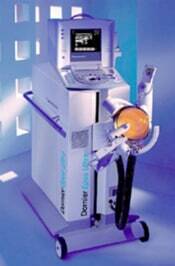 It is the only FDA approved system in service since 2002. This High Intensity, ultrasound guided ESWT system is composed of three main parts:1) Shock Wave Therapy System - this portion creates the actual shock waves (also known as acoustic waves, sound waves or pressure waves). These waves travel through the water filled bladder of the therapy head. Your foot is placed against this cushion during treatment.2) Articulated Arm - This easily movable arm makes finding a comfortable position much easier for your ESWT treatment near me. The therapy head is attached and can move around your heel to pinpoint the exact area of pain and inflammation in the heel.3) Ultrasound Imaging System - This allows the Podiatrist to see inside your foot and target the plantar fascial attachment to the heel spur, but not directly hit the bone, or blood vessels; which helps to keep complications to a minimum. It is more effective and safer than any other ESWT machine on the market. This allows the Podiatrist a "real time" image during treatment to assure proper placement of pressure waves and to correlate your areas of pain with physical findings. Shockwave therapy intentially creates calculated amounts of targeted damage, known as micro-trauma, aimed at the precise area the patient marks their pain, which is usually where the plantar fascia inserts into the heel bone. Why would a patient want more damage? Shockwave therapy triggers the body’s natural healing mechanisms; jump starting the bodies healing process. Increased fresh collagen and new tissue growth into the area then occurs via neovascularization. Fascia is made mostly out of collagen. In over-use injuries collagen never gets a chance to heal after overuse, either during work or leisure activities and gradually breaks down, creating chronic inflammatory scar tissue. It is this tissue that leads to most of the heel pain. The micro-trauma created during ESWT for heel pain causes subclinical acute pain and inflammation which triggers the body to produce fresh collagen as part of the natural healing process. By creating a controlled targeted fresh acute injury, Extracorporeal Shock Wave Therapy begins an increased blood flow to the freshly injured area. Your bodies immune system draws fibroblast, osteoblasts and chondroblast- the bodies healing cells- to the area to heal your heel! ESWT directly addresses the fact that ligaments, tendons and fascia have anatomically poor blood flow (kind of like the tendon in a chicken leg). Shock wave is the gold standard treatment for plantar fasciitis for Pittsburgh patients. While there will always be individual patients who don’t qualify for a specific procedure, ESWT has been used successfully on all major patient populations. See the contraindications below for specific conditions it is not recommended for. ESWT is generally a good option for heel pain/ heel spur patients whose symptoms have not resolved with cortisone injections. Shock wave therapy often eliminates the need for future cortisone injections in most patients. Are patients happy with Shockwave Therapy? Yes. In fact, many of our patients with heel spurs in Pittsburgh have been happy enough to recommend it to others. Many patients have flown in family members from other states to have treatment at our facility; both because it worked for them, and because we are a portion of the charge in other places. Is ESWT surgery? Is Shock wave therapy invasive? ESWT is not considered surgery. Shockwave therapy does not break the skin so is considered a non-invasive treatment. It's a major reason podiatrists prefer it as an option prior to open surgery. Is ESWT a good option for people who have already had failed surgery for plantar fasciitis? Yes. Although this aspect has not been officially studied and failed surgery can complicate any treatment: Anecdotally and in our own experience, many patients get exceptional results with Shockwave therapy after failing surgery. Doctors around the world, especially in Europe, have successfully used this same shock wave technology since the early 1990s'. ESWT in NYC isn’t an invasive procedure and therefore has very few unintentional effects and complications. Most patients experience some soreness for several days after the procedure with no other ill effects. Our heel pain Bridgewater patients frequently report this as the extent of their discomfort. Are there any medications I should stop taking before my treatment? NSAIDs and Steroids!. The podiatrist will review your med list as she would before to any procedure just to be certain. Patients using Coumadin are usually asked to come off this medication for 7 days before the procedure date. As a rule, no medication type disqualifies a patient from Shock wave therapy. What exercises should you do for plantar fasciitis? Gentle stretching is best. What is the recovery time for plantar fasciitis? Every one is different. What should I do after my procedure? What’s the after-care?